Police hunting the killer of 11-year-old Rhys Jones have arrested a seventh person. The 19-year-old is being questioned by detectives on suspicion of murder. A second 19-year-old suffered minor injuries as he tried to escape arrest. A further two males aged 15 and 16, and two females aged 15 and 18, were arrested in Croxteth and Norris Green. Officers would also like to speak to a woman who was seen pushing a pram near the scene shortly before Rhys was shot. Det Supt Dave Kelly, the senior investigating officer, said: "We know from our inquiries there was a woman pushing a pram minutes before Rhys was killed and we believe she will have passed within close proximity to the killer. "She is described as wearing white wide-legged trousers with a dark tunic style top, almost like a smock. "She had dark hair, possibly tied back and was pushing a dark coloured pram at about 1925 BST." Spectators and players at Everton's home game held a minute's applause at Goodison Park where Rhys's favourite team were playing Blackburn Rovers. Rhys's parents, Melanie and Stephen, and his brother, Owen, stood with Everton manager David Moyes as cheers erupted from the nearly 40,000-strong crowd. 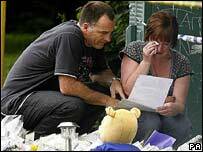 Mr Moyes said: "It is something we are all bitterly saddened about, we feel so much for the family, and this needs to be sorted out quickly. It is something that should not be allowed to happen in this city." Police have said Rhys "was in the wrong place at the wrong time". Mr Kelly said that the bike-riding teenage killer emerged at the back of the Fir Tree pub from an estate behind the pub. He said that the boy cycled at the back of the pub for a few minutes before firing three bullets in Rhys's direction - one of which passed through the boy's neck. 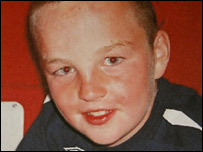 Mr Kelly said Rhys was walking home alone when he was killed and that he might have been shot by a revolver. A 15-year-old boy, arrested in the Norris Green area of Liverpool on Friday, remains in police custody. Two boys aged 14 and 18, earlier arrested on suspicion of murder, were released on Thursday night. Detectives investigating the shooting have appealed for witnesses to "stand up and be counted". 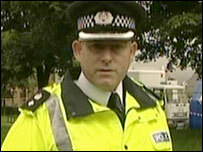 Chief Superintendent Chris Armitt said residents must "examine their consciences" and take a stand against gang culture. Speaking at a press conference near the spot where Rhys was shot, Ch Supt Chris Armitt said: "We understand that people are concerned about giving information to the police, we understand that people are frightened, that's natural. "What I want to say to people is, listen, they've got to stand up and they've got be counted. "We have ways of protecting members of the public who come forward with information, we can protect their identity. If they have evidence that needs to go before court that can be done using something called special protective measures." Officers have been handing out leaflets in the area with a special number for young people to text information anonymously. Police have said that they are examining an abandoned bicycle, found in an area with a different postcode to the shooting. Officers also confirmed descriptions of the killer's firearm, describing it as a black handgun with a long barrel. Some 100 officers are working on the investigation, supported by 200 staff from the Merseyside Police gun crime unit, Matrix, which was set up two years ago to tackle the problem. Detectives are treating the inquiry as Category A Plus - the "most serious" of crimes.